McLaren's stand was always busy at the Geneva Motor Show, with great people around including Ron Dennis himself. They also had the best dessert, champagne, the MP4-12C with and without a roof and the F1 LM XP1. Of course the main attraction was the P1 hypercar, and we talked to someone who probably knows more about that than anybody else: Paul Mackenzie, leader of the P1 development program, and head of Special Operations at McLaren. Google doesn't help much when you want to do your research on this guy. He is the head of Special Operations which made the insane X-1 among others using the MP4-12C's platform. We were also assured that "he is great", and we will "really enjoy talking with him". Both turned out to be true while according to Paul, he is not even a proper petrol head. That's because he is a material engineer who started at the aerospace industry before joining McLaren in 1999. After learning about composites and being aware of the supercars of the era like the F1 or the Jaguar XJ220, he almost ended up working for the automotive industry straight away when was offered a job by the company involved with Yamaha's never happened OX99-11 supercar. Never mind, a bit of aerospace knowledge is always welcome at supercar makers! 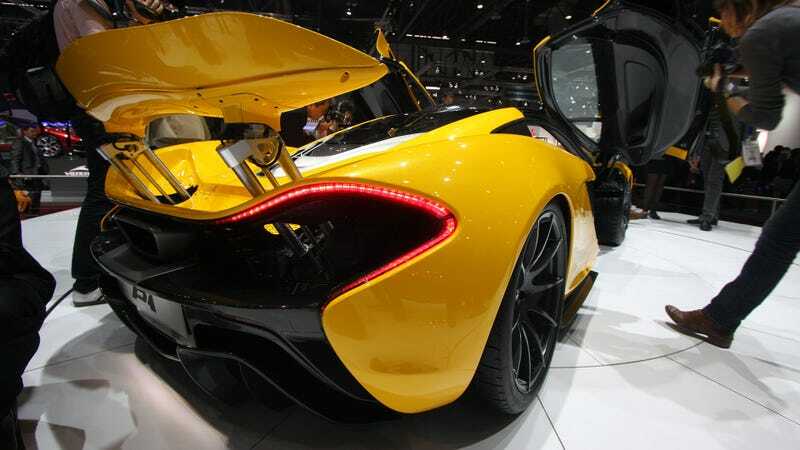 We are standing behind the P1, but I still want to start with its predecessor. The F1 is a legend, and McLaren is very much aware of its importance. They keep track of about fifty F1s around the world, and with two or three changing hands every year, they are usually also helping with the transactions. Not too many F1s were destroyed so far, and no matter if it's just a regular service or a complete rebuild like Rowan Atkinson's car, owners take them back to their birthplace 23 miles from London: Woking. Talking of Rowan Atkinson's $1.4 million repair job, he can't help having a proud smile. Since the impact was so severe that the engine got detached from the chassis, getting it fixed was a challenging job even for McLaren as they had to look for all the long forgotten tooling and drawings. I thought everything have been digitalized at the spaceship called McLaren, but it turns out they still have to do some old-fashioned library research for special cases like this. So there we are, standing not far from the Papaya Orange legend (which Lewis Hamilton is not getting after all), and very close to the yellow car that they hope will become one. The P1's development needed some sacrifices from all parties. Paul's job was mostly about making sure that the team of around a hundred engineers and technicians work together with the aerodynamics team and the designers led by Frank Stephenson instead of everybody trying to push through their own ideas at all costs. The P1 program started with some very hard target numbers, and everything had to come together in order to reach them. When I ask why they make only 375 P1s instead of let's say 400, he says that at this level, volume is the driving factor for most buyers. They promised to make "under 500" cars in the beginning, Ferrari will produce 499 (already sold) LaFerraris, so the P1 will be much more exclusive at 375. If the P1 is just as impressive on the road as on paper, that $1.3 million price tag will most likely to get much higher in the following years. We are just about to say goodbye to Paul, but before doing that, we got some great news from him about a smaller model coming no later than 2015. Paul said after ticking both the supercar and the hypercar box, an entry-level McLaren is the next step for the brand. For those of you out there who didn't make it to the P1's or the MP4-12C/12C Spyder's order list, here is your chance to smile!